Our product range includes a wide range of amlodipine besilate tablets usp 10mg and amlodipine besilate tablets usp 5mg. 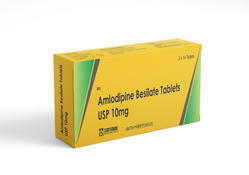 We are the leading and prominent Manufacturer and Supplier of Amlodipine Besilate Tablets USP 10mg. Amlodipine Besylate Tablet is used to treat high blood pressure and other heart complications.